Description: Metallic mercury (i.e., elemental mercury) may sometimes be used in ethnic folk medicine and for religious practices. 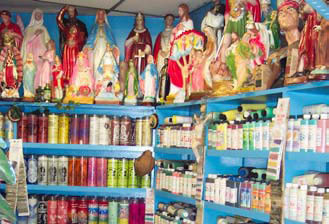 It is most commonly sold under the name "azogue" (Hispanic), but may also be labeled as "vidajan" (Haitian/Creole) or "quicksilver" (English) in ethnic stores or botanicas specializing in spiritual and religious items. Persons practicing religions, such as Esperitismo, Santeria, and Voodoo, may carry the mercury in pouches, wear it as a charm or necklace, swallow it in drinks or as capsules, sprinkle it around a child's bed or inside a car for protection, or burn it in devotional candles. There may be other religions and cultures that use mercury or mercury-containing products in spiritual practices. Purpose: The use of azogue in religious practices is recommended in some Hispanic and Caribbean communities by family members, spiritualists, card readers, and santeros. They believe it can ward off evil spirits, bring good luck, or cast love spells. It is also sometimes used for medicinal purposes. Potential Hazards: Even low levels of mercury exposure may cause negative health effects. Persons that use metallic mercury in spiritual and religious practices or sell it in stores, are often exposed to high levels of mercury vapor over a long period of time and may suffer serious health effects. If a mercury spill occurs, persons should immediately contact their state environmental agency for instructions on proper clean-up and disposal. They should contact their public health department or poison control center if they have been exposed to mercury vapors. Recycling/Disposal: Elemental mercury is considered by the U.S. Environmental Protection Agency (EPA) to be a hazardous waste because of its toxicity. Therefore, it is recommended that elemental mercury and items that contain liquid elemental mercury be properly disposed of at household hazardous waste collection events and sent to a mercury recycler for reclamation. Statutes and Other Information: It is not illegal to use elemental mercury; however many states, including Connecticut, Maine, New Hampshire, New York, Rhode Island, and Vermont, restrict the sale and distribution of elemental mercury. Labeling of hazardous household products, including elemental mercury, is required under the Federal Hazardous Substance Act (FHSA), which is mandated by the Consumer Product Safety Commission (CPSC). However, much of the sale and distribution of elemental mercury for religious and ritualistic purposes operates underground. In some instances, persons have even been to known to sell azogue out of their homes. There are many examples of community campaigns, organized by local departments of public health and environmental protection, which provide outreach and education to those who participate in the cultural and spiritual use of metallic mercury. Links to these specific outreach and education programs and other useful information can be found in the "General References" section at the bottom of the page. Description: "Parad" is a combination of mercury and silver and is used for the worship of God in Indian religious traditions, most notably Hinduism, and in Ayurvedic medicine. As a liquid metal, Hindus regard mercury as the sperm of Lord Shiva and believe that it is the purest metal, with not only religious importance but medical significance as well. Because mercury is liquid at room temperature, a solidification process using silver metal produces the various items used in Indian tradition. The exact ratio of mercury to silver varies - some websites state that parad is made of 90 percent mercury and 10 percent silver, while others claim only 25-30 percent is mercury. Parad Shivling, parad beads, and Indian idols of Parad Ganesh and Parad Lakshmi are considered sacred. Purpose: The worship of parad in Indian culture is said to destroy one's sins - Hindus believe that by touching a Parad Shivling, one's sins are removed. The solid parad balls (i.e., mercury balls) are threaded and worn around the neck in the form of a necklace to protect one from evil spirits. Wearing these parad beads (e.g., parad mala, parad goli) is also believed to be useful in controlling various diseases, such as high blood pressure, diabetes, and asthma, and to increase sexual power. 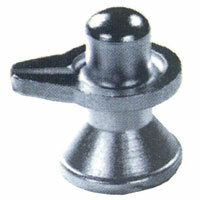 Solid mercury-based Indian idols are used in homes and in temples to keep away the evil eye. 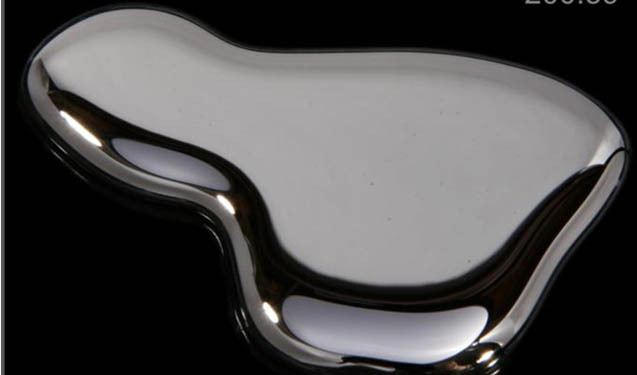 Potential Hazards: Because the mercury is mixed with silver and solidified, there is little risk of exposure to a mercury spill from parad items. However, it is unclear whether there is a possibility of mercury vapor being emitted from these items. A common practice among devotees is to immerse parad items in milk and then drink the milk; studies have shown that after submerging parad in milk, the milk may contain high concentrations (.07ppm) of mercury. This is especially true when the parad remains immersed in the milk for a long period of time because the pH of the milk becomes more acidic as the lactose changes to lactic acid and may cause surface leaching of the mercury. Recycling/Disposal: Mercury-containing items, such as parad figurines (i.e., Indian idols, Parad Shivling) and jewelry (i.e., parad beads), are considered universal waste. These products should be disposed of at household hazardous waste facilities and sent to a mercury recycler for reclamation. Statutes and Other Information: These items are generally imported to the U.S. from India and are legal to have in the U.S. However, many states restrict the sale and distribution of these kinds of mercury-added products. The state members of the Interstate Mercury Education and Reduction Clearinghouse (IMERC) define a novelty item as a "mercury-added product intended mainly for personal or household enjoyment or adornment, including items intended for use as practical jokes, figurines, adornments, toys, games, cards, ornaments, yard statues and figures, candles, jewelry, holiday decorations, and footwear and other items of apparel." Therefore, figurines and jewelry made of parad fall under the category of a mercury-added novelty product, and are subject to sales restrictions and prohibitions in many states, including California, Connecticut, Illinois, Indiana, Louisiana, Massachusetts, Minnesota, New Hampshire, New York, Oregon, Rhode Island, Vermont, and Washington.